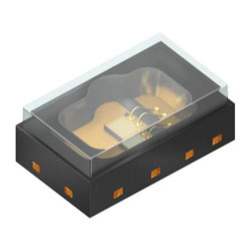 Osram Opto Semiconductors’ new product family includes Bidos PLPVQ 940A, its first VCSEL. The device is now available from RS Components. This is a further future technology that the company is incorporating into its product portfolio, laying the way for new fields of application such as 3D sensing. Now after the acquisition of Vixar, the company is setting new criteria with this VCSEL, incorporating facial recognition for mobile devices. The VCSEL operates as a light source, illuminating the face evenly with infrared light. A camera is utilised to capture the important features of the user. The image is then compared with the image of the user stored in the system – if the two match the device will be unlocked. The device wavelength is 940 nm and offers a maximum efficiency of 27% with an output of 300mW. Two bond wires supply the laser diode evenly and rapidly with energy. The angle within which Bidos gives illumination is 65-degrees x 78-degrees. The package size is 1.9mm x 2.2mm x 0.85mm.